Our mission statement here—“SAM connects art to life”—truly guides much of our work and many of the decisions our leadership team makes. We see art as a response to life and as something that should be accessible to everyone in their different journeys. Believing our art is relevant, we want to show people how it’s relevant. It’s why we have a blog series where we talk about our collection objects! In the museum space, we also connect art to art. When SAM expanded in 2007, the curators made a point of bringing their permanent collection displays together in thoughtful ways. We published a book at the time, called Bridging Cultures, which outlined the curators’ thinking. If art connects to life, and if all of us who share life are interconnected, then all art is somehow linked too. Finding those points of connection can be difficult. I love wandering our permanent collection galleries because these connections across people and across time become clearer and more meaningful to me. Mexican American artist Emilio Amero was born in Ixtlahuaca in 1901. He trained at the Fine Arts School of San Carlos, and in 1924, he worked as an assistant to Diego Rivera on a mural project at the Ministry of Education Building in Mexico City. In 1955 Amero finally realized his own mural, not in his native Mexico, but in Norman, Oklahoma, where he had taken up a teaching post at the university about a decade earlier. He worked in a wide range of materials over his career, but his work in lithography was particularly significant. 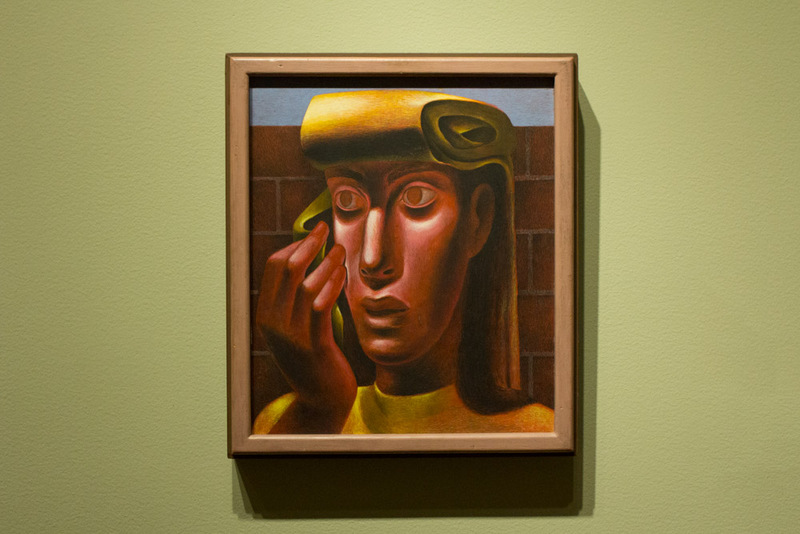 So, why are three Amero paintings, including this striking Head of a Woman, hanging in our gallery of Pacific Northwest Modernism, alongside works by Mark Tobey and Guy Anderson? From 1941-1947, Amero brought his talents to Seattle. Invited to teach at the University of Washington on a Walker-Ames Fellowship, Amero established a reputation as a skilled artist and teacher. 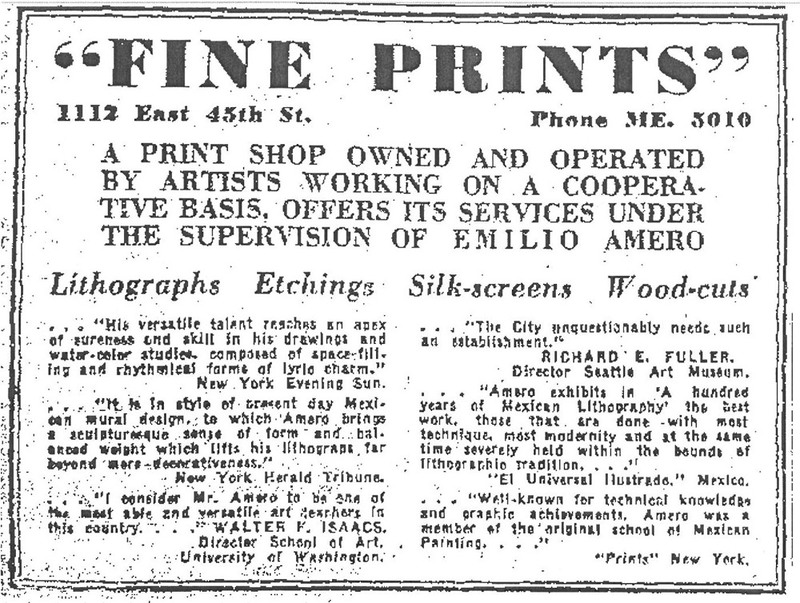 A 1942 advertisement for a print shop Amero ran quotes Walter F. Isaacs, then director of the School of Art at the University of Washington, who calls him “one of the most able and versatile art teachers in this country.” In 1943 Amero moved to the faculty at Cornish School of the Arts. For the school’s 30th year, opening of September that year, he served as director and instructor of painting, drawing, commercial and graphic arts—joined on the faculty, as he is today in our galleries, by Guy Anderson, who taught children’s art. Not to brag on us, but we have an important collection of Amero paintings that is a monument to his time here. Like other notable artists working in Seattle at the time, many of whom grew up in the Pacific Northwest, Amero was geographically far from the forms of Modernism developing in New York. His vision was essentially different because it was rooted in Mexico. There, Modernism developed after the Social Revolution of 1910, as artists like Amero and Rivera shrugged off what had become an oppressive European influence, looking instead to ancient indigenous Mexican art. The heritage of Amero’s native Mexico inspired his form of Modernism much like the land and peoples of the Pacific Northwest inspired Tobey and Anderson. Image: Head of a Woman, 1947, Emilio Amero (Born Ixtlahuaca, Mexico, 1901; died Norman, Oklahoma, 1976), tempera on panel, 18 1/4 x 15 1/2 in. Seattle Art Museum, Eugene Fuller Memorial Collection, 47.134, Photo: Natali Wiseman. Caption for ad: Seattle Daily Times, August 9, 1942, p. 30.